TENAA in China has certified the upcoming Vivo Y-series budget smartphone. The Vivo Y71 is expected to be officially announced in China on April 5th and is priced at around Rs.12,000. The device highlights with its 5.99-inch display and 13MP rear camera. The Vivo Y71 is expected to come in Black, Gold and Rose Gold color options. 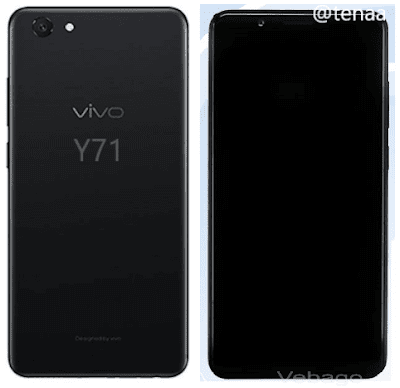 According to the TENAA listings, the Vivo Y71 runs on Android 8.1 (Oreo) with Funtouch OS and is powered by 1.4GHz Quad-Core Snapdragon 425 processor with Adreno 308 GPU for graphics. The Dual SIM smartphone measures 155.87 × 75.74 × 7.8mm and Weighs 150g. A 3285mAh battery powers the device. It doesn't come with a fingerprint sensor. The Vivo Y71 will have a metal unibody design as per the images published by TENAA. Coming to the camera, it features a 13MP rear camera with LED Flash and a 5MP front-facing shooter for selfies and video calls. It sports a 3GB RAM with 32GB of internal storage, expandable up to 128GB using a microSD card. There is a 5.99-inch HD+ 18:9 aspect ratio display with 2.5D curved glass and a screen resolution of 1440 x 720 pixels. Connectivity options on the smartphone include 4G VoLTE, Wi-Fi 802.11 b/g/n, Bluetooth v4.1, and GPS.